I’m incredibly excited to announce that I’ll be reading and discussing Tom Brady vs. the NFL: The Case for Football’s Greatest Quarterback at the amazing Trident Booksellers & Cafe on Newbury Street in Boston Wednesday, December 5 at 7 p.m.
I’ll read some selections, talk about what’s behind the book (what it is, what it isn’t, and why — that sort of thing) and engage in a Q&A session. I’ll also sign books for those who are interested. The Trident is an awesome, awesome bookstore (as I’m sure you know) and I’m beyond honored that they’ve invited me to engage with readers in their space. Please plan to join me for a great evening. For those who need them, directions are easily accessed via my events page. On Sunday, October 7, 2012, Tom Brady started the 164th game of his NFL career, leading the New England Patriots to a 31-21 victory over the Denver Broncos. That number, 164, is meaningful, because it brings Brady up equal in career starts with his boyhood idol, Joe Montana. 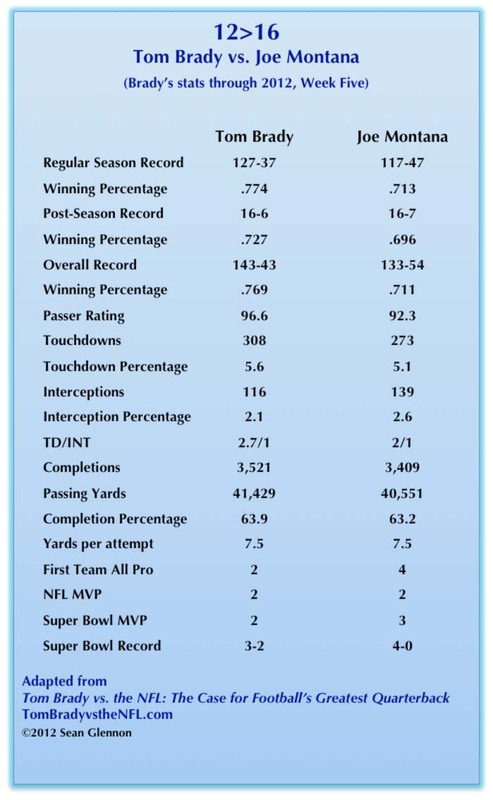 Here, adapted from Tom Brady vs. the NFL: The Case for Football’s Greatest Quarterback, is a side-by-side comparison of the two great quarterbacks’ accomplishments through Brady’s first 164 starts. Tune in Saturday night at 10 p.m. (or, you know, set your DVR) to see me and learn about how and why Tom Brady vs. the NFL: The Case for Football’s Greatest Quarterback came to be. With the next exciting installment of Tom Brady vs. Peyton Manning scheduled to take place late Sunday afternoon at Gillette Stadium, it seems like a good time to share a bit of what I wrote in my chapter on football’s all-time greatest quarterback rivalry in Tom Brady vs. the NFL: The Case for Football’s Greatest Quarterback. This is just a little bit of the opening section of one of the longest chapters in the book. There will never come a day when Tom Brady’s name isn’t connected with Peyton Manning’s. Not ever. Brady and Manning are bound together like Bird and Magic, Ali and Frazier, McEnroe and Borg. If you want to discuss the greatness of one, you have to talk about how he stacks up against the other. That’s the way it’s been since Brady emerged as an elite quarterback. And that’s the way it will continue to be. Even though the rivalry between Brady and Manning is fundamentally dissimilar to other classic sports rivalries. Ali and Frazier traded punches. McEnroe and Borg traded shots … one athlete against another. And when a bout or a match was over, one guy had won and the other had lost. Simple. Bird and Magic had teams around them, but they were still on the court at the same time. They faced each other. Each had an effect on the other’s performance. Really, there’s no such thing as a true rivalry between individuals playing the same position in football. The game’s just not set up for it. Sure, Brady’s Patriots and Manning’s Colts squared off repeatedly during Manning’s tenure in Indianapolis — each team coming away with its share of big wins. But it’s not as if the two great quarterbacks ever actually engaged each other on the field. At best, a meeting between two teams with star quarterbacks is like an American League pitchers’ duel — though in reverse, with the focus on offense rather than defense. Each of the big-name players knows he needs to find a way to put more points on the board than his rival, but neither ultimately has any direct effect on the other’s performance. That makes it tough, if not impossible, to talk about a football rivalry in the context of a single game, or even a series of head-to-head matches. You can look at stats, of course. You can try to assess leadership, a key component of the position. And if a game is tight, you can potentially look at how each player performs in the clutch. But in the end, each man is facing a different defense with different schemes and abilities. And neither can accomplish a thing without meaningful contributions from the other offensive players around him. So when you start to talk about Brady and Manning, you can, if you like, look at the results of the twelve meetings between the Pats and Colts in which Brady and Manning were calling signals. And if you do, you’ll see that Brady and the Patriots went 8-4 overall, 6-3 in the regular season and 2-1 in the playoffs. That’s a winning average of .667 across the board. Look just a bit closer and you might also note that Brady’s Patriots had a winning record over Manning’s Colts both in Foxborough (5-2) and in Indianapolis (3-2). And knowing all of that will get you almost nowhere. So you want to read the whole thing now, right? There’s a purchase link on the info page here: Tom Brady vs. the NFL: The Case for Football’s Greatest Quarterback. Go get it. I’ve got a good bit of electronic media stuff on tap for Monday and Tuesday. I’ll be on TV across New England Tuesday night, and I’ve got some amazing radio stuff happening on Monday evening and Tuesday morning. Monday, October 8 at 6:35 p.m.
I’ll join Joe D’Ambrosio on WTIC’s Sports Talk. If you’re in the Hartford, Connecticut area, you can tune in at 1080 AM. If not, just go to that WTIC web site and stream it. Joe and I had a great back and forth last time I joined the show. I’m looking forward to talking with him again. Tuesday, October 9 at 7:05 a.m.
I’ll be in the studio at Rock 102 with Bax and O’Brien. It’s one of my favorite shows to do for a good reason: The back and forth is always great. I have fun. And I think we do some great radio. So, you know, if you’re in Western Massachusetts or northern Connecticut, tun in. If not, stream it. Tuesday, October 9 from 11 a.m. to noon. I’ll join the Bawstin Diehards — Anthony Pepe, John Sapochetti and John Pica — at NBC Sports 1510 AM (WWZN) out of Quincy, Massachusetts for a full hour in the studio. The guys are gonna have some copies of Tom Brady vs. the NFL: The Case for Football’s Greatest Quarterback to give away while I’m there (I’ll sign ’em). Should be fun. I don’t think you can stream the show, so tune in. Tuesday, October 9 at 10 p.m.
I’ll join hosts Jade McCarthy and Randy Scott on NESN Daily to talk about Tom Brady vs. the NFL: The Case for Football’s Greatest Quarterback. This will be the first TV appearance I’ve done for this book, and my first time appearing on NESN. I’m really looking forward to it. There’s nothing to stream here. If you’re in New England and you’re a sports fan, you already know where to find NESN on your cable or satellite system. Just tune in. If you’re looking for something to listen to right now, check me out on last night’s What’s Brewin’ with George Brew. Had a nice, casual chat with George about the book and football. It was a lot of fun. I come in at about the one hour mark. Take a listen. I’ve set up two more opportunities for you to get a signed copy of Tom Brady vs. the NFL: The Case for Football’s Greatest Quarterback. I’ll be at the Barnes & Noble stores in Newington, New Hampshire (always great to get back to the Seacoast) November 3 and in Millbury, Massachusetts December 8. Details here. Again, if you don’t see an appearance on the schedule at a store near you, contact your favorite bookstore and ask them to bring me in. Or contact me to let me know where you’d like to see me show up. I’ve got another radio interview scheduled, too. I’ll be on WWZN, 1510 AM out of Quincy, Massachusetts at 11:10 a.m., October 9 (yes, there’s a web site, but it doesn’t reflect the station’s current programming) talking to Anthony Pepe, John Sapochetti and John Pica on “Bawstin Diehards.” Should be fun. For something you can hear right now, check out the interview I did with Anthony Crisante and Mike Procopio on Patriots Extra Wednesday night. I come in at about the 38-minute mark. I had a great time doing the show. I’ve scheduled the first two signings of Tom Brady vs. the NFL: The Case for Football’s Greatest Quarterback. I’ll be signing at the Barnes & Noble stores in Holyoke and Walpole, Massachusetts on November 16 and November 17 Details here. I hope to add more signings soon, so keep checking back if you don’t see a store near you. You can also contact your favorite bookstore and ask them to bring me in, or contact me to let me know about a great place to do a reading or signing. I’ve also got a radio interview coming up that you may want to tune into if you’re in central Vermont. I’ll be on Radio Vermont, WDEV, 550 AM, 96.1 FM out of Waterbury, October 7 at 9:10 p.m talking to Jeff Fuller on “SCORE, the Sunday Night Special.” I’ll be on opposite Chargers-Saints on Sunday Night Football, but, hell, the Saints should be 0-4 by then. And they may well finish the evening 0-5. The home crowd’s going to be none too happy. So, you know, just turn down the sound for 15 minutes and listen to us talk about the greatest quarterback ever to play the game. It’s always great to hear from readers, which has been happening a good bit lately on Twitter. Thanks to all who have taken the time to get in touch. Hope I’ll hear from more readers soon. @seanglennon @gemski_82 Fantastic read for any true football fan! @seanglennon Thank you so much for writing that book. Finally the truth is acknowledged and I have something to show my ignorant friends. Not sure why I’m only just now getting around to putting this up (OK, well, maybe I do and maybe it’s just plain old fashioned sloth), but here it is just the same. Spent some time last week in the studio at WRSI, 93.9 The River in my home city, lovely Northampton, Massachusetts, talking to my pal Monte Belmonte. The result: An interview piece that actually makes me sound like I know what I’m talking about. Monte has a knack for putting those together, which is one of the many things that makes him a good guy to know. We talked about Patriots football. We talked about NFL history. And, of course, we talked about Tom Brady vs. the NFL: The Case for Football’s Greatest Quarterback. This is it, right here. It’s a fun piece. Definitely worth a listen. So, you know, listen already. The good folks at WEEI have asked me to take part in an opening day event they’re hosting at Backyard Bar & Grille in Enfield Connecticut. So that’s Sunday, September 9. As you know, the Patriots will open the 2012 season with an away game against the Tennessee Titans, which kicks off at 1 p.m. The WEEI event takes place from 12:30 to 2:30. I don’t know all the details, but I do know that there will be beer specials, prizes and giveaways, including a few signed copies of Tom Brady vs. the NFL: The Case for Football’s Greatest Quarterback. I’ll also have copies for sale in case you’re not lucky enough to win one and still want a copy (and, of course, I’ll be happy to sign those, too). Plus they’ll have the game on TV. And watching with a group is always more fun than watching on your own. Should be a great time. Stop by.